I have been a bit uninspired with eating out lately. I don’t know if it’s that I’ve looked at too many menus only to think that they’re all looking the same, or if it’s that when I have gone out in the past few months, I haven’t really been “wow’d”, or if it’s that I’m feeling like I can pull off great meal in the comfort of my own home with a great bottle of wine while wearing sweatpants at a fraction of the cost. Either way, I haven’t gone out for many dinners in the past few months. With a planned trip to Victoria for the weekend, I thought it was the perfect excuse to get myself out of the dining rut with a visit to Ulla restaurant. I was first introduced to Ulla restaurant in En Route magazine’s “top new restaurants in Canada” feature back in November last year. I stole the magazine off the plane specifically because I wanted to visit the restaurant. When I showed the article to Ben, he mentioned he thought that was where Kris Barnholden (formerly of Mis Trucos) is now. If you never went to Mis Trucos, you missed out as the menu was thoughtful and creatively ingredient driven. I didn’t know how much influence Kris has in the kitchen at Ulla, but whatever it is, I knew I’d be in for a treat. The vibe of the restaurant is casually upscale and felt very “unVictoria-like”. When we called a week in advance to get reservations for a Saturday night, all we could secure was an 8:45pm. I was somewhat shocked about that, but the packed room verified their popularity. The cocktail menu had so many sips that I wanted to try. In the end I had to go with the Kakoii, which means good-looking in Japanese because that’s how I was feeling that night out. 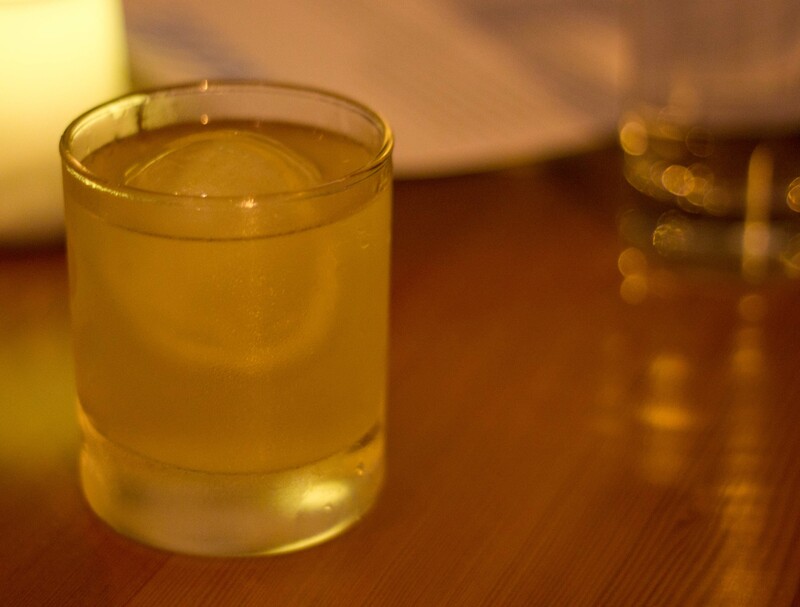 Kakoii -gin, ume plum wine, lemon, cinnamon simple syrup with a ‘ballin ice cube. My cocktail was good and Ben’s whiskey sour was even better. Nothing like a stellar cocktail to set the tone for a fantastic meal. 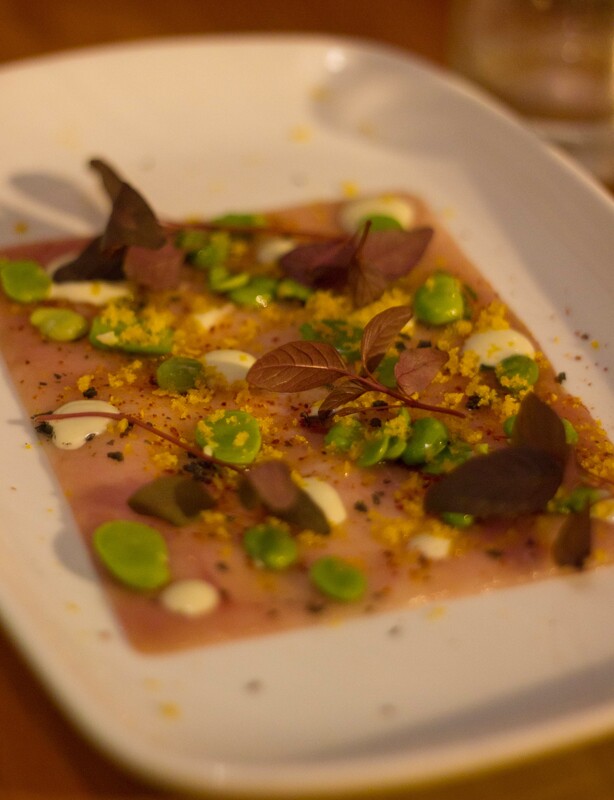 Albacore tuna carpaccio with fava beans, espelette & white anchovy mayo. 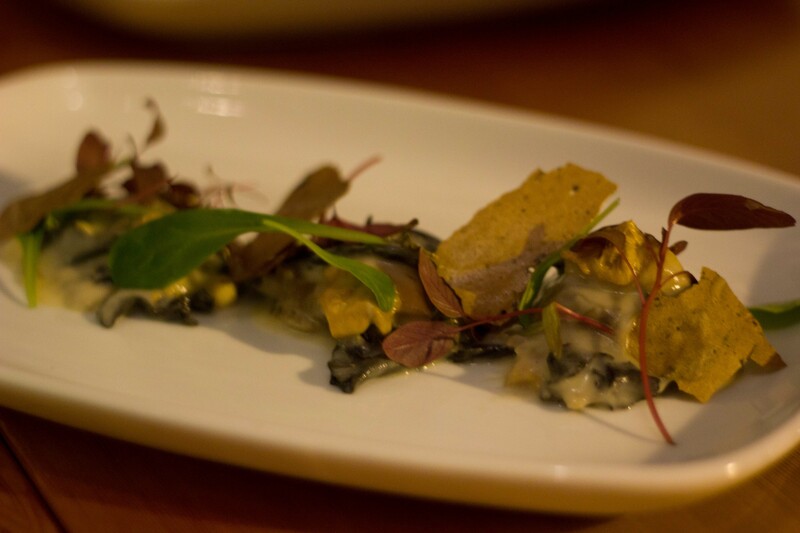 Porcini, wild mushroom and sweetbread ravioli, celery root puree and black garlic crisps. 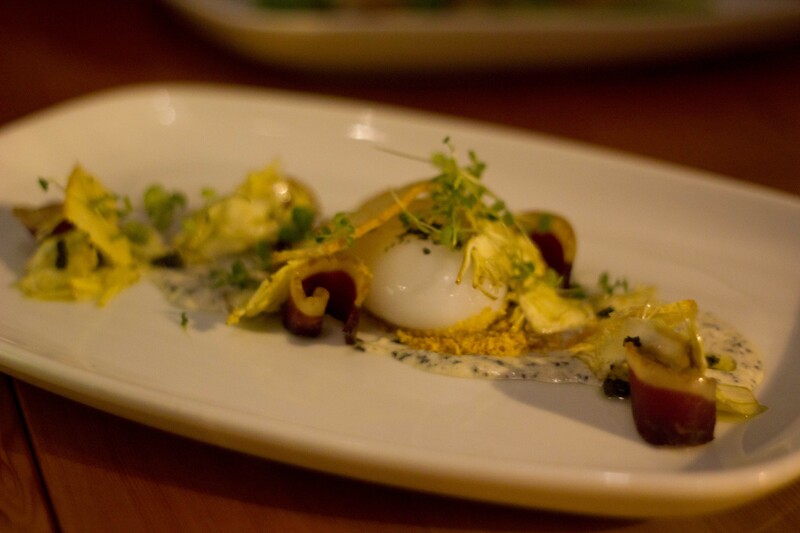 63°C duck egg with artichoke, mushrooms and truffle oil. 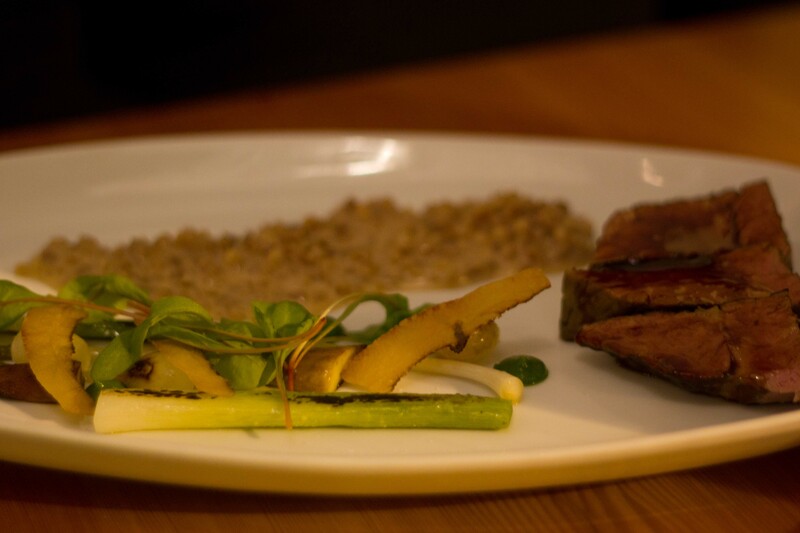 Shortrib steak with barley risotto and wonderfully cooked spring vegetables. 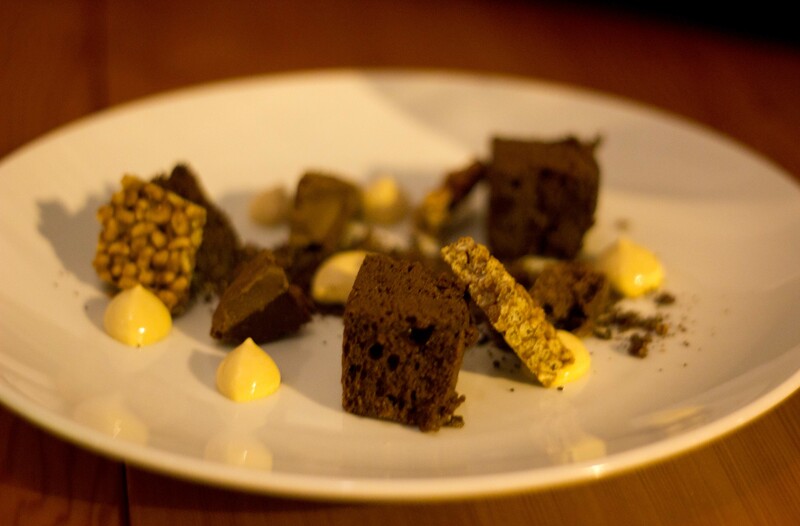 Chocolate cake, rice crispy crunch, dulce de leche cream, aerated chocolate and chocolate soil – the best dish of the evening. Chef Brad Holmes, the chef at Ulla has done a wonderful job of creating beautiful plates of food that deliver wonderful flavours. I’m happy too that he has Kris Barnholden in the kitchen with him, (in what role I’m not sure) because there were some Mis Trucos-esque dishes on the menu, including the sous vide duck egg and the polenta cubes, (which I wanted but didn’t order) that I was happy to see weren’t lost forever. 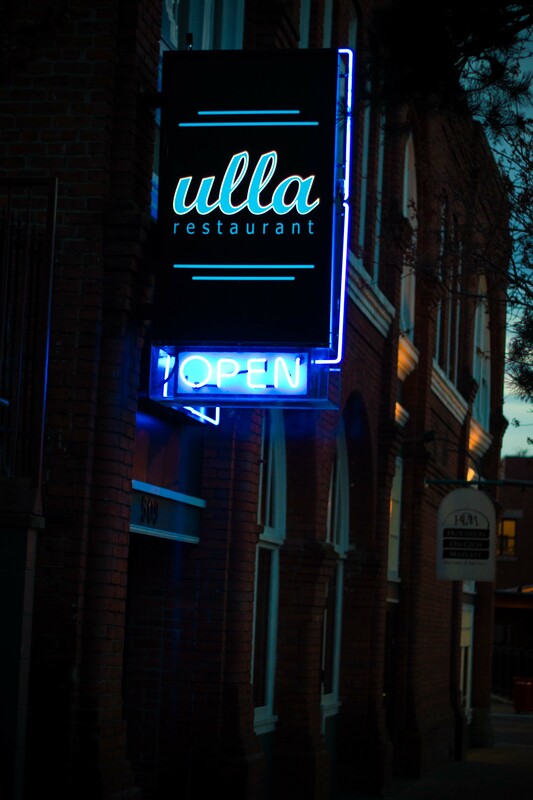 My meal at Ulla was stellar and was an evening out that made me want to have other good evenings out. Time to start building my must eat this summer in YVR list. Oh and my advice to you? Put Ulla on your “when I’m in Victoria next, I gotta try” list. Next PostNext Barcelona! And Let the Eating Begin.